ACPIN-Consumer Price Index for Industrial Workers (CPI-IW) - September, 2018 released. Sub: Central Civil Services(Revised Pay) Rules, 2008 - Section II of the Part ‘A' of the First Schedule thereto - entry pay for direct recruits appointed on or after 1.1.2006 and pay fixation in the case of persons other than such direct recruits. Subject: Grant of entry pay to the eligible teachers of KVS - reg. No. 2011/F(E)III/2(2)/3 New Delhi, Dated: 11.10.2018. Sub :- Amendment to Appendix V of the Indian Railway Establishment Code Vol. I, 1985 Edition (Study Leave Rules). In exercise of the powers conferred by the proviso to Article 309 of the Constitution, the President is pleased to direct that Appendix V of the Indian Railway Establishment Code Vol. I, (1985 Edition) (Third Re-print Edition 2008) be amended as in the Advance Correction Slip No. 134 attached. AddI. Director General, APS, New Delhi . Subject: Grant of benefit of pay fixation at time of promotion to Postmaster Grade-I. Subject: – Payment of DA to the CDA pattern employees of CPSEs on 5th CPC pay scales governed by HPPC recommendations w.e.f. 01.07.2018-reg. Subject: – Payment of DA to the CDA pattern employees of CPSEs on 6th CPC pay scales governed by HPPC recommendations w.e.f. 01.07.2018. Subject:- Submission of ‘Life Certificate'. Sub: Policy improvements in Dental Health Care System. Subject : Transfer on deputation/foreign service of Central Government Employees to ex-cadre posts under the State Governments/ Union Territories or to any entity controlled by and located in the States / UTs – relaxation of para 8.5 of O.M. dated 17.6.2010. 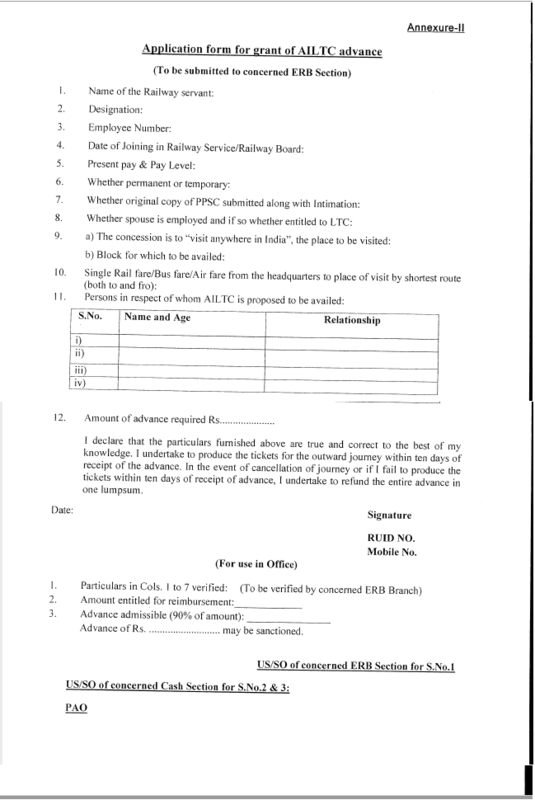 Subject : Travel entitlements of Government employees for the purpose of LTC post Seventh Central Pay Commission – clarification reg. 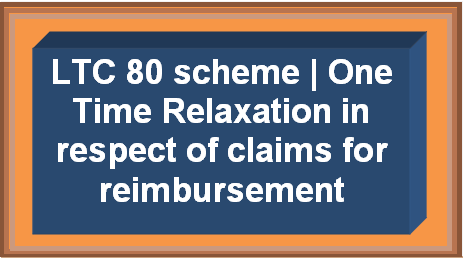 The undersigned is directed to refer to this Department’s OM No.51016/2/90-Estt (C) dated the 10th September, 1993 vide which a scheme for grant of temporary status to the casual employees was framed. The scheme applied to those casual labourers who were in employment on the date of the issue of the OM and had rendered one year of continuous service in Central Government offices, which meant that they must have been engaged for a period of at least 240 days (206 days in the case of offices observing 5 days week). The scheme did not apply to Departments of Telecom & posts and Ministry of Railways. 2. As per the scheme, after rendering three years’ continuous service after conferment of temporary status, the casual labourers were to be treated at par with temporary Group ‘D’ employees for the purpose of contribution to the General Provident Fund. Further, after their regularisation, 50% of the service rendered under temporary status was to be counted for the purpose of retirement benefits. Submission of Digital Life Certificate by Disabled and aged (80 years and above) pensioners in the cities of Mumbai/Ambarnath, Chandigarh, Mysore, Vadodara, Dehradun, Bangaluru and Trivandrum. Sub: Declaration of Productivity Linked Bonus (P.L.B.) for the employees of the EPFO for the year 2017-2018. Subject: Official dealings between the Administration and Members of Parliament and State legislatures - Observance of proper procedure. PCDA(CC) : E-Suchna Project (Paperless Reporting System) - Implementation reg. Release of Grant-in-Aid to Pensioners' Association by DoP&PW for implementation of Web-based "Pensioners' Portal" Project. Sub: Cadre restructuring of IT cadre in Railways/Production Units - injustice meted out to staff- review urged-reg. 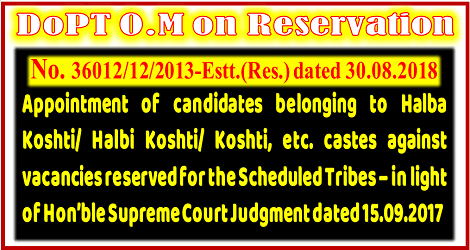 Reservation : Appointment of candidates belonging to Halba Koshti/ Halbi Koshti/ Koshti, etc. castes against vacancies reserved for the Scheduled Tribes – in view of Hon’ble Supreme Court Judgment dated 15.09.2017. Sub: Hon'ble Supreme Court judgment dated 15.09.2017 in the SLP(C) No. 9574 of 2013 filed by All India Adiwasi Employees Federation against judgment dated 20.12.2012 of Hon'ble High Court of Bombay, Nagpur Bench - Appointment of candidates belonging to Halba Koshti/ Halbi Koshti/ Koshti, etc. castes against vacancies reserved for the Scheduled Tribes - regarding. 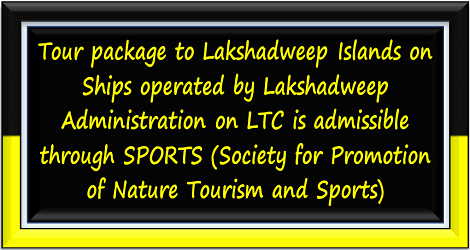 DoPT Clarification on LTC : Admissibility of SPORTS (Society for Promotion of Nature Tourism and Sports) tour package to Lakshadweep Islands on ships operated by Lakshadweep Administration. 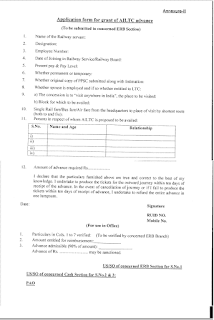 Sub: Railway Services(Revised Pay) rules, 2008-Section II of the Part’A’ of the First Schedule thereto- entry pay for direct recruits appointed on or after 1.1.2006 and pay fixation in the case of persons other than such direct recruits. Railway : 6th CPC DA @ 148% w.e.f. 01.07.2018 to Railway Employees who continuing to draw pay in pre-revised scale. Subject: Vigilance Clearance and Major/Minor Penalty Certificate in respect of PPS of CSSS - Zone of consideration for the pending Select Lists of Sr. PPS - reg. PCDA Order: Online Completion of APARs in 'SPARROW' for the year 2018-18. Subject: Online Completion of APARs in ‘SPARROW’ : for the year 2017-18. I Shri./Smt./Km. .................................................................... (Name of the Railway servant) wish to confirm that I am availing AILTC (Any place in India) in respect of self/family member(s) for the block year........................................to visit......................................................... (Place of visit) during .......................................... (dates of journey). It is stated that I or the fam ily mem ber for whom I wish to avail AILTC has/have not availed of the same during the present block year. I declare that the particulars furnished above are true and correct to the best of my knowledge. I undertake to produce the tickets for the outward journey within ten days of receipt of the advance. In the event of cancellation of journey or if I fail to produce the tickets within ten days of receipt of advance, I undertake to refund the entire advance in one lumpsum. Advance of Rs. ........................... may be sanctioned. MACP: Violation of Government Order and judicial Verdicts on granting MACP to Organized Accounts Cadre - reg. Subject: - Discrimination in granting Grade Pay on Grant of Financial Benefits under M.A.C.P. - Violation of Government Order and judicial Verdicts. No. E(P&A)II-2018/PLB-3 New Delhi, dated : 10.10.2018. Subject: Payment of Productivity Linked Bonus to all eligible non-gazetted Railway employees for the financial year 2017-18. Subject to completion of minimum six months continuous service and being in service as on 31st March, 2018.
a) : Employees appointed on purely temporary ad-hoc basis. Yes, if there is no break in service. b) : Employees who resigned, retired from service or expired before 31st March, 2018. As a special case only those persons who superannuated or retired on invalidation on medical grounds or died before 31st′ March, 2018 but after completing at least six months regular service during the year will be eligible for the ad-hoc bonus on pro rata basis in terms of nearest number of months of service. Subject: Grant of Non-Productivity Linked Bonus (ad-hoc bonus) to Central Government Employees for the year 2017-18. EPFO: Settlement of Death case claims within 7 days - reg. 5th CPC- Dearness Relief from July 2018 to CPF beneficiaries in receipt of Ex-Gratia Paymet.